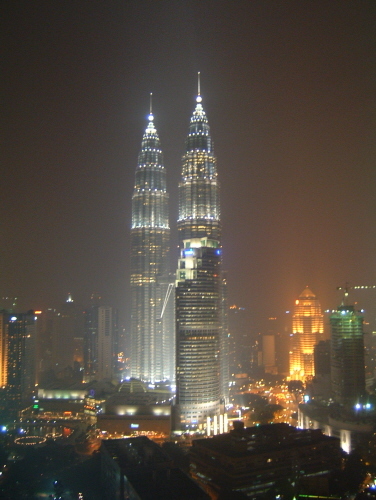 Just when we all thought the worst has past for this year, the haze returns to Kuala Lumpur (tag). 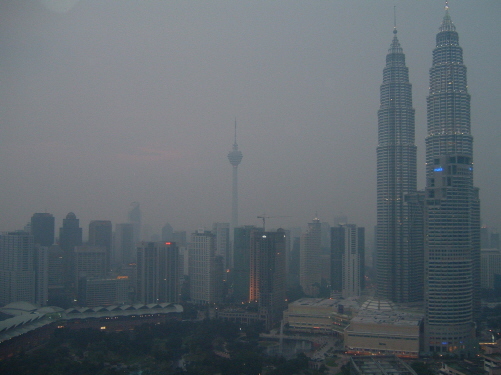 But then, the meteorological department did warn us all that the haze would return after the raining season ended. With El NiÃ±o’s here, I have a feeling that this part of the year is going to be the toughest for us all. In term of climate, that is. p/s – The Little Brown Jug has safely returned to Ann Arbor. With Michigan’s 28-14 win against Minnesota, we and some school called Ohio State are 5-0 — the only undefeated teams so far in the Big Ten. Because of the win, I expect Michigan to move from #6 to #5. Other undefeated teams nationwide (I mean the US) are Boise State, Florida, Auburn, Georgia, USC, Oregon, Missouri, Virginia Tech, Wake Forest, Rutgers, West Virginia and Louisville. All together, there are 14 undefeated teams so far. Out of 14 teams, I think 11 would stay undefeated after next week’s matches, including Michigan and (unfortunately) OSU. Next’s Michigan State. Bush would say “Bring ’em on”. pp/s – oh yeah, new banner. The image was manipulated by me; original picture is produced by the USDA. Taken from Wikipedia.